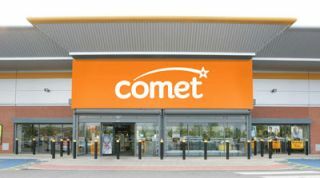 Comet set to close 41 stores by end of November | What Hi-Fi? Troubled electrical retain chain Comet, now in administration, will close 41 stores by the end of November if a buyer can't be found. Closing down sales have already started in 27 stores and will begin in 14 more outlets next week, says administrator Deloitte. The remaining 195 stores are expected to continue trading over the Christmas season with "generous discounts", but after that their future remains uncertain. The Financial Times reports that the first of the closures will begin next week. Some 330 job losses have already been announced at Comet's head office. "While the administrators will look to redeploy staff from any stores which do face closure to other stores nearby, there will inevitably be redundancies," says Deloitte in a statement. "The administrators continue to hold discussions with parties who have expressed interest in parts of the business."